Summer is with us so what better time to sit back and enjoy a virtual cocktail and get the chance to win a share of £5,000 – LeoVegas Casino is offering that bumper prize pool as part of its Spiña Colada tournament. To be in with a chance of winning a prize, just get spinning on the Spiña Colada slot between now and Monday the 21st of August (2017). The top 10 coin wins in any round will share a £4,000 booty. Get a score in the top 50 and you’ll also be entered into a special prize draw where a further £1,000 will be awarded. In the main contest, finishers from 4 to 10 will each pocket £100. The 3rd place finisher will win £500 and the runner-up £800 with the overall winner trousering a £1,000 reward. In the top 50 raffle draw, 20 players will win £25 a piece with a further 10 each winning £50. All prizes in both the tournament and the draw are in cash and don’t come with any play through requirements. Powered by Yggdrasil Gaming, Spiña Colada is a 5 reel, 25 payline cocktail-themed slot that comes with the developer’s usual high-end visuals. Central to the action is a re-spins feature. Land a winner and the successful symbols are locked in place and a re-spin follows. These continue as long as a new matching symbol joins the cluster. Fill reels with matching symbols and your win will be boosted by a multiplier. Also on offer are 4 base game extras that offer an assortment of added wilds, extra symbols to create winning lines, a guaranteed win with 3x multiplier or a 5-of-a-kind winner. You can also land free spins which can combine the re-spins with the modifier extras to great effect, potentially boosting payouts with a multiplier of up to 15x. 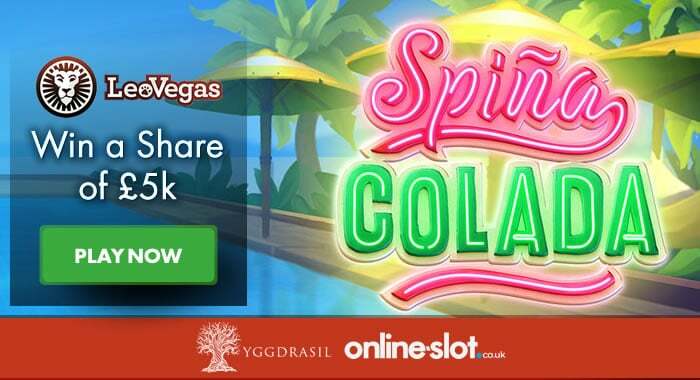 Yggdrasil Gaming is one of our favourite developers and they’ve come up trumps once again with Spiña Colada – the slot will be launched in the UK on the 22nd of August but is exclusively available at LeoVegas Casino. So why don’t you raise a glass at LeoVegas and you could be toasting a special tournament win? Now is a great time to visit LeoVegas Casino if you haven’t played there before. New players will receive 20 Rainbow Riches free spins on registration. You can also take advantage of deposit bonuses worth up to £1,600 as well as 100 more Rainbow Riches free spins.